Are you pursuing medical education? If yes then here you can see fulfilling your vision of getting Government Medical Jobs 2018. We Chekrs, are one portal from where all of Medical Opportunities specifically for govt sector can be tracked down. Just the way professions in the medical field ranges requirements of the medical professionals also varies. The scope in the government sector for candidates who have completed it with expertise is infinite and well paid. Well if are lacking the resources at Chekrs you are delivered list of the Medical Sarkari Naukri that can give you a promising future. The best part for all of these jobs is they cover every field of specialization including researches as well. Though the list of options for Medical Jobs in Govt Sector is infinite, here we sought out the difficulty of filtering options as per preference. Here we deliver options to view jobs as per the professional such as Govt Jobs for Medical Lab Technician, Assistant, Officer, MBBS Doctors, Gynecologists, etc. 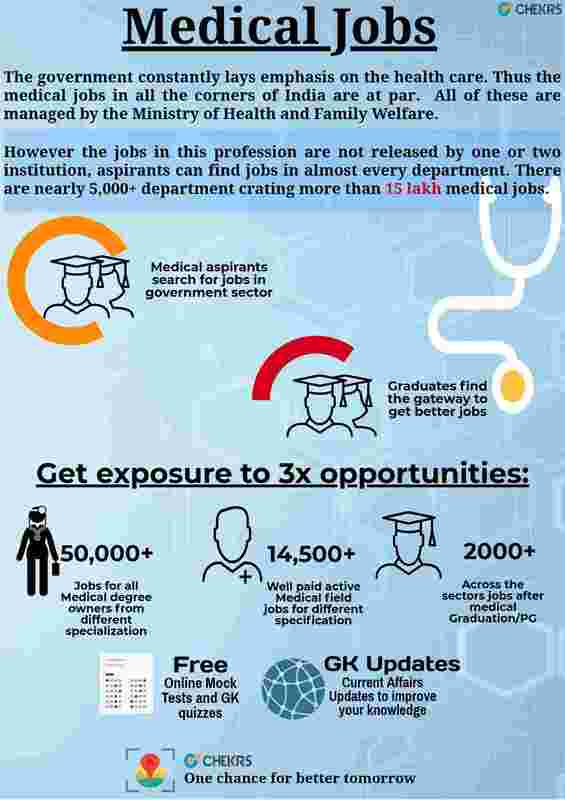 Also if state govt jobs interests you then Medical Government Jobs in Telangana, Delhi, Punjab, Aandhra Pardesh, Chennai, etc are here to choose and apply. Moreover every Latest Medical Vacancy can be checked out as soon as it is released through subscription of Chekrs. Why opt Chekrs for Latest Medical Jobs? At Chekrs we firmly believe in being the pool of information. More than just providing the information we deliver information through which you assure your selection just in a few attempt. Here you can get study material for different posts of departments that you would have applied. The previous papers, model papers, and even the online mock tests will help you perform better in the exam.